The graduate computer science option is primarily oriented toward Ph.D. research. Students complete advanced coursework to achieve a breadth of knowledge in the core areas of computer science, and specialized coursework in their intended research area as directed by their research advisor and the graduate option representative. The M.S. degree entails a thesis and coursework and is normally awarded in the first two years as part of the overall progress toward the Ph.D.
experience in effectively communicate their ideas in writing and in oral presentations. Master's students are expected to achieve a thorough understanding of the mathematical and algorithmic foundations of computer science, and have gained significant knowledge in the area of research specialization through their coursework, and to demonstrate promise in independent research through an original thesis. Graduate study in computer science within the Computing & Mathematical Sciences department is oriented principally toward Ph.D. research. The Ph.D. program requires a minimum of three academic years of residence; required coursework is generally completed within the first two years. Students must maintain high academic standards during their graduate residence. A student’s Ph.D. research must exhibit originality in the formulation, analysis, and solution of a problem that is significant to the field of study. The option representative and executive officers are available to discuss concerns regarding academic progress. There is no terminal M.S. degree in Computer Science. In exceptional circumstances (typically when a student leaves the Ph.D. program without completing the degree), the option representative may approve the awarding of a M.S. degree, if the course requirements have been met and the student has passed the preliminary examination (both are described below). Course requirements. Students must complete a minimum of 135 units of courses numbered 100 or greater, including research units (CS 280). Students should consult with their adviser to ensure balance in the selected courses. CMS 290 is required for all first year CS graduate students during each term (fall/winter/spring). Advanced courses in computer science. Completion of a minimum of 54 units of CS courses numbered 100 or greater in addition to units earned for reading, research, and independent projects. Units outside computer science. Completion of a minimum of 27 units outside computer science. Courses jointly listed with computer science cannot be used to fulfill this requirement. Preliminary examination. Toward the end of the first year, all incoming students must take a preliminary examination administered by the faculty. Its purpose is to ensure a solid and broad knowledge in computer science, and in the event of a deficiency, to direct the students to necessary courses and reading. Candidacy. To be recommended for candidacy, a student must have completed the required coursework, have passed the preliminary examination, have entered upon a course of research approved by his or her thesis adviser, and have passed a candidacy oral examination. The candidacy oral examination is administered by a committee that consists of four faculty, is approved by the option representative, and is chaired by the adviser. The examination ascertains the student’s breadth and depth of preparation for research in the chosen area. The candidacy examination should be taken within the first three years of graduate study. Advising and Thesis Supervision. In order to facilitate close supervision and a highly research-oriented environment, each student is admitted directly to an adviser and research group. A course of study is determined in consultation with the adviser. Occasionally students will be admitted into more than one group. Changes in affiliation may occur with the common consent of the student and the new adviser. 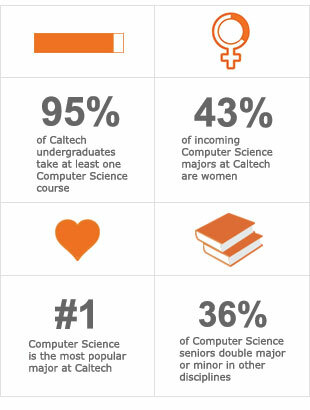 Students meet regularly with their adviser throughout their time at Caltech, and are encouraged to do the same with other members of the faculty. Thesis and Final Examination. A final oral examination will be scheduled and given after the Ph.D. thesis has been submitted for review to the student’s adviser and thesis committee; the latter consists of at least four faculty approved by the option representative, and is chaired by the adviser. The thesis examination is a defense of the thesis research and a test of the candidate’s knowledge in his or her specialized fields. A subject minor is not required for the Ph.D. degree in computer science. However, students majoring in other fields may take a subject minor in computer science, provided the program is supervised by a computer science faculty adviser, is approved by the computer science option representative, and consists of 45 units sufficiently removed from the student’s major program of study.